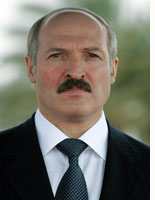 BelarusDigest > Myths > Is Alexander Lukashenka a phenomenon unto himself? Is Alexander Lukashenka a phenomenon unto himself? Lukashenka's rule is usually characterized as ironfisted. However, he would not have been able to rule since 1994 without a certain degree of public consent, authoritarian conditions imposed on the political opposition, and support from Russia. In serious independent research, he appears much more often as a reflection of a country where an upgraded understanding of the Soviet model of politics is very much alive. His social contract is based on constant economic growth and a more equal level of the distribution of wealth. The building of a strong power vertical, strong control mechanisms, functional (in the Soviet manner) state institutions as well as little corruption used to give Belarusians a better feeling about his leadership. However, the model retained by Lukashenka was based on heavy subsidies in the form of cheap oil and gas from the Russian Federation. Without such subsidies and repression of the political opposition, the model would not be sustainable.